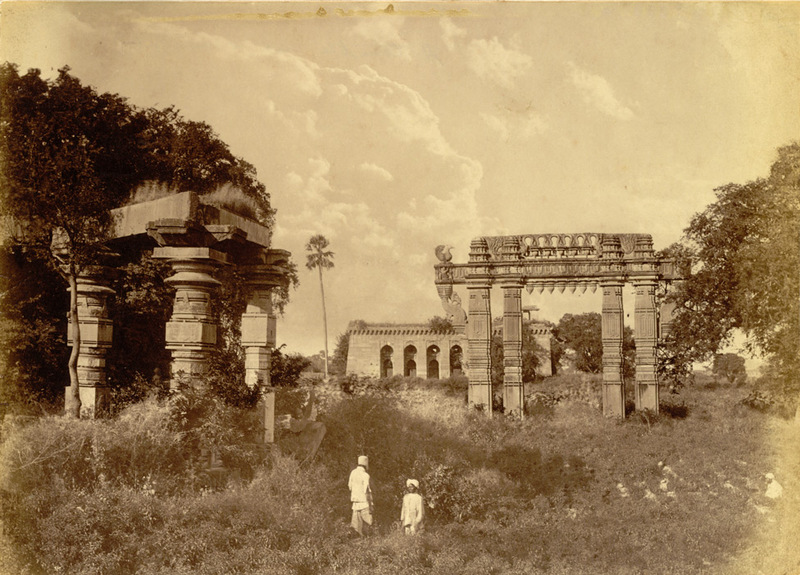 Photograph of the gateway and temple ruins at Warangal in Andhra Pradesh, from the Lee-Warner Collection: 'Bombay Presidency. William Lee Warner C.S. ', taken by an unkown photographer in the 1870s. Warangal was the capital of the Kakatiya rulers in the 12th-13th centuries and together with Hanamkonda nearby, they were important political and artistic centres of the eastern Deccan. The circular city of Warangal was founded in the 12th century by the Kakatiya ruler Ganapatideva and was occupied by the Muslims in later times. There are two concentric circles of fortifications. The outer circuit is an earthern rampart entered through four arched gateways. The inner circuit is of stone and has four gateways. In the centre of the city there is a ruined temple dedicated to Shiva Svayambhu and another smaller one also dedicated to Shiva which dates from 14th century.